A key deadline at the Oregon Legislature was reached on Tuesday, April 18. For the most part, bills had to either move forward by that date, or they were dead for the session. While a number of pieces of legislation important to small and mid-sized farms and environmentally responsible agriculture moved forward, many died as well. In a recent article, the Salem Statesman Journal noted that political negotiations around raising revenue to address Oregon’s $1.6 billion funding shortfall and a potential transportation bill may be impacting the fate of unrelated bills, quoting FoFF’s Policy Director Ivan Maluski. Further, in late April, top legislative budget writers proposed a number of steep cuts if new revenue is not found. Under the proposal, Oregon’s Farm-to-School Program would receive no funding at all. Farm-to-School, though a small part of the state’s overall budget, provides and important incentivize for schools across the state to buy local produce to be used in school mean programs, providing kids with locally grown food and farmers with new sales opportunities. Now is a critical time to raise your voice to your state legislators and urge them to maintain current funding levels for Oregon’s Farm-to-School Program. Write and call your State Legislators today. 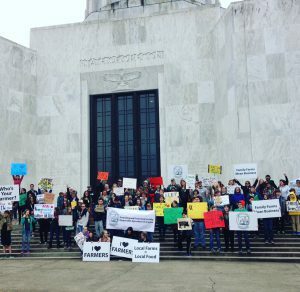 HB 2469/SB 1037 – These bills would have allowed local communities to protect farmers from contamination risks associated with genetically engineered (GE) crops in the face of Oregon’s ongoing failure to adopt needed farmer protections. Both bills received hearings in their House and Senate committees, but no action was ultimately taken. SB 1037 had a public hearing on April 13, with farmers from various parts of southern Oregon and the Willamette Valley testifying in support. Because these bills have died, a voter-passed ban on growing GE crops in Josephine County will not be allowed to go into effect for the time being. HB 2038 – This bill would maintain funding levels for Oregon’s nation-leading Farm-to-School Program. It passed its first committee on April 4, and is now awaiting consideration in the Joint Ways and Means committee, which will determine whether and how much funding will be available for this program over the next two years. Read more from the Blue Mountain Eagle and stay tuned for further opportunities to make your voice heard. HB 2739 – This bill would protect farmers who have experienced unwanted contamination from genetically engineered crops by allowing farmers to sue GE crop patent-holders when their products have crossed property lines and caused financial damage. It was advanced by the House Judiciary Committee on April 18, and moved to the important House Rules committee, where it will require additional public hearings before it can move forward. Read more from the Portland Tribune and stay tuned for further opportunities to take action. HB 2085 – This bill would establish a beginning farmer tax credit in Oregon to encourage landowners to enter into multi-year land leases with beginning farmers and ranchers. Because this bill is in the House Revenue Committee, it was immune to the April 18 cut-off date for most bills. However, it has not yet received a hearing and is at risk of falling to the wayside as the state grapples with how to make up for a nearly $1.6 billion funding gap. SB 805 – This bill would provide funding necessary to maintain current service levels for the Oregon Statewide Public Service Programs, including Extension and Agricultural Research. In 2015, the Oregon Legislature made significant new investments in these programs, which have led to new work in support of small farms, on-farm conservation, and more. However, Oregon’s budget crises has put these recent gains at risk. This bill passed its original committee earlier in the session and is now in the Joint Ways and Means Committee where tough decisions will be made about funding levels. Read Friends of Family Farmers’ April 17 testimony in support of continued service level funding for OSU Extension and Agricultural Research Programs. This list of bills above is snap-shot of important bills we’ve been involved in this session, and is not a comprehensive list of all legislation important for small and mid-sized farms and healthy local food systems. Stay tuned to our ‘Muckboots in the Capitol’ blog for continued updates on these and other bills throughout the session. As always, we urge you to contact your Legislators on the various bills above to let them know where you stand.